4 years & up. The Cubelets Twenty kit comes with 20 magnetic blocks that can be snapped together to make an endless variety of robots with no programming and no wires. You can build robots that drive around on a tabletop, respond to light, objects, and temperature, and have surprisingly lifelike behavior. Instead of programming that behavior, you snap the cubelets together and watch the behavior emerge like with a flock of birds or a swarm of bees. Combine a host of sensors and action blocks to build your own robotic creations. 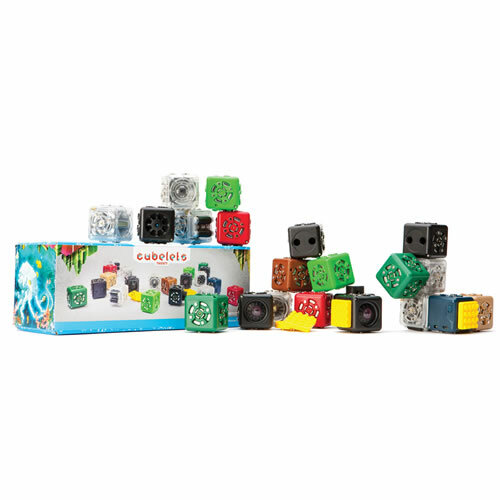 The Cubelets 20 kit lets you experiment with 15 different types of Cubelets and includes multiples of the most popular pieces.